Description: Eastbound coal train led by CSX 570 on the former B&O main. 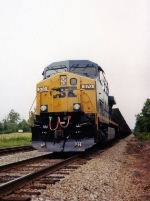 Description: CSX 570 heads a coal train on the former B&O. Notice the old B&O signals to the right. They still govern this main line. Description: Auto carrier unit train coming to pass just a few feet from us standing on BRC 530 switcher. Title: Local/Coal empties returning to Fairmont, W.Va. Description: CW44AC # 570 leads train 823 out of Bradenton with the Tropicana train. Description: CW44AC # 570 leads train 0823 out of Bradenton with the Tropicana train. Description: CW44AC # 570 with train 0823 approaches a grade crossing north of Port Manatee. Description: CW44AC # 570 with train 0823 startles a flock of vultures at Port Manatee. Description: trailing unit on an empty hopper train from newport news departing fulton yard to go up the mountain to return to clifton forge. Description: AARAS 13 with foreign power approaches Jerome Lane on its way to the Alton and Southern Gateway Yard. Description: CSX 570 pulls an auto rack across the Barren River Bridge. Description: 507 on IHB at Calumet City, IL. Description: CSX AC44CW bringing a south bound down the runaround track in the CSX yard at Manchester. Description: With the "trash taken out", Q41006 heads east.